A visit to Fika in the morning is a sensory delight. The aroma of freshly baked Swedish pastries fills the air—cardamom, cinnamon, and the comforting smell of baked dough mingle with the fragrance of coffee grounds as the first espressos of the day are dialed in. In Sweden, Fika can be a verb. In Toronto, Fika is a hidden gem—a cafe nestled into an old house in a seemingly secret corner of Kensington Market where the baristas pull shots of Pilot Coffee alongside a display case abounding with delectable house-baked goods. Since it is fairly unusual for specialty coffee shops to have such a robust in-house baking program, I was curious to connect with the talent behind Fika's Swedish cinnamon buns, cardamom buns, flourless lavender espresso brownies, and elderberry chamomile thumbprint cookies—to name a few. 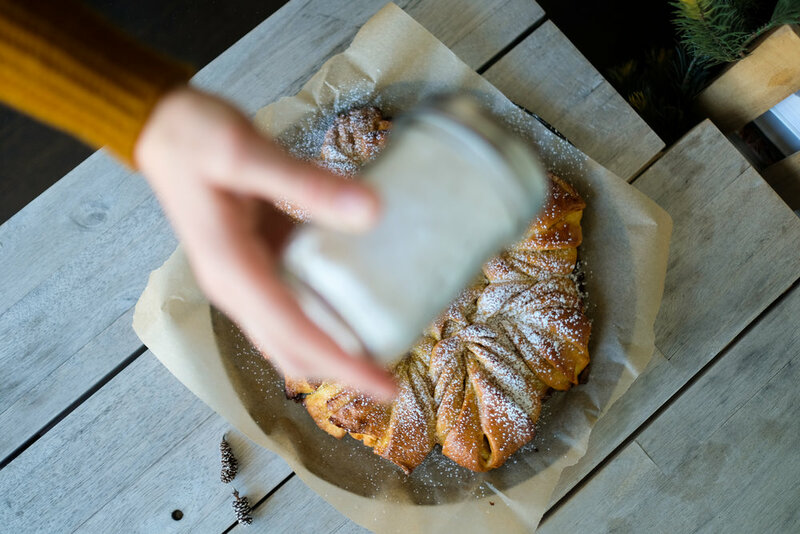 Today's post features an interview and insanely delicious holiday recipe for Saffron Cardamom Star Bread in collaboration with Stephanie Gagnon—the brains and braun behind the pastries at Fika. Aside from her time spent baking in the cafe kitchen, Steph also runs a gorgeous food and recipe blog called Pinotte. For this post, Stephanie kindly invited me into her home–which was appropriately decorated for the holidays, and teaming with cookbooks—where we spent the day drinking coffee, baking, shooting photographs, hanging out with her dog Enzo, and sampling this deliciousness (rough life, I know!). I hope you enjoy reading about Steph's experience as a professional baker for a specialty coffee shop, and learning how to make this show-stopping holiday star bread as much as I have. The recipe is included at the bottom of the post along with a short video of the process. Cheers! tLBCC: Can you tell us a little bit about yourself, your background and your journey to your current role as pastry chef at Fika Cafe in Kensington Market? Stephanie Gagnon: I grew up a little bit north of Montréal and my journey to becoming a baker is a bit of a winding road. I was always the “artist” of the family, but was also a math nerd in high school. So, when the time came to deciding on a major in University, and I wasn’t too sure what I wanted to be, I chose to enroll in something I was good at—actuarial mathematics. After a while, it became obvious that mathematics was not the right career path for me and I needed something more creative. I changed programs, but still had the feeling that I had not found what I really wanted to do. What I did love, however, was spending hours reading food blogs and cookbooks, and baking simple cakes or cookies or even trying to make my own sourdough bread, when really I should’ve been studying for my exams. That’s exactly when my now husband got an amazing career opportunity and we decided to move to Toronto. I put my studies on hold and with a lot of free time, I enrolled in a baking class. After my first day, I knew instantly that this is what I needed to do. I handed out my resume to a few bakeries after I finished my course and got a job at a coffee shop in an old teal colored house in the Kensington Market named Fika. tLBCC: You were hired as Fika was changing ownership and as a result you helped curate a new pastry menu for the shop. Can you tell us about your experience building out the pastry program at Fika? What were you trying to achieve? Stephanie Gagnon: When I got the job, I did some research on Swedish baking and the whole concept of Fika. Fika can be literally translated as going for a coffee break, but it's really so much more than that. It’s a whole culture and way of life in Sweden. It’s taking the time with friends or family to connect and catch up, or by yourself with a book perhaps, while having pastries and coffee. Doesn’t it sound so lovely? Especially in a city like Toronto where things seems to be moving too fast and people are always busy? Everyone should go for Fika everyday! Anyways, I fell in love with all of it, including the fact that they always have cinnamon buns and how they put cardamom in everything. I wanted to bring the pastry menu closer to what you would find in a typical coffee shop in Sweden. It was definitely a challenge, because I was just starting my career as a baker and I’d never done anything like this. Also, I completely revamped every single item on the menu, which can be quite risky for a business to do. But in the end, I poured my whole heart into it, tried different recipes, got rid of some, perfected others and now we have a solid menu and are selling more pastries than ever. Our guests seem to enjoy what we’re doing. tLBCC: Is there anything unique about Swedish baking? 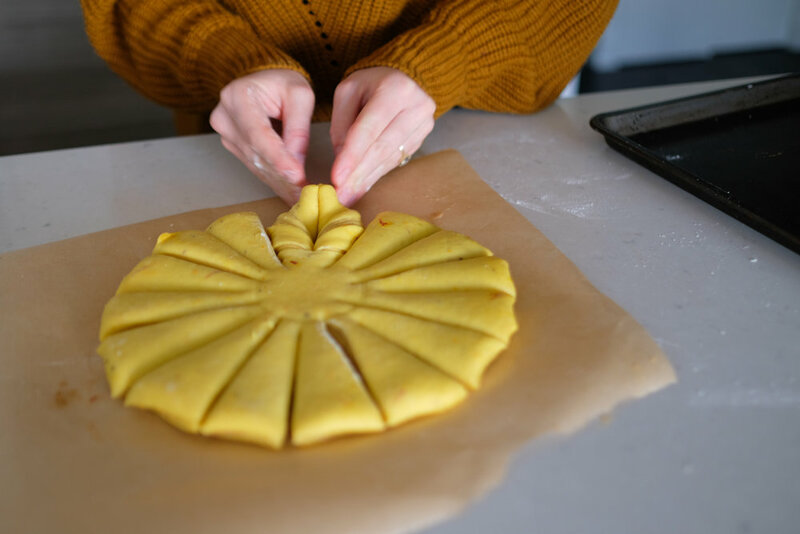 Was it hard to pin down a recipe for a traditional Swedish kanelbullar? Stephanie Gagnon: Swedish baking is uncomplicated and so rooted in traditions. Fika is one of them and coffee is an essential part of it as well. Originally, ladies would host Fika at their house by inviting their friends over for coffee and a minimum of seven different kinds of cookies. Seven... Minimum... My dream! In Sweden, they often have very specific recipes for different holidays. For example, saffron buns are baked on December 13th, celebrating an old legend about Lucia the Saint, who was believed to bring light to winter’s darkness. Semlor, yeasted cardamom buns filled with almond paste and whipped cream, are associated with Fat or Shrove Tuesday (fettisdag) and were eaten as the last indulgence before the fasting period of Lent. To top it all off, cinnamon buns (kanelbullar) matter so much to Swedes, they even have their own National day, October 4th. It took me months to find the perfect recipe to make them, tweaking the amount of butter or flour, playing with how long it needs to rise, what’s the right amount of spices (a lot, in fact!) and how I should shape them. I’m so happy with the way the cinnamon buns taste and look at Fika, but I feel that this recipe could still be perfected for years. One day! tLBCC: Do you ever work on bar as a barista? If so, has working with specialty coffee influenced the way you bake at all? Stephanie Gagnon: I usually do once a week and I love to work with the other baristas at Fika—although I must admit that my latte art skills are far from being as good as theirs. Coffee is so interesting as a baker. I compare it to working with dough and making bread. It behaves differently every single day, based on the temperature and the environment around us. You’ve got to really understand it, with all your senses, and adapt to it. I love how it’s never the same every single day and that there’s always more to learn about coffee. When I work at Fika, I try to participate in the daily dialing in process. Training my palate to taste coffee in all its complexity has definitely helped me to taste and describe food better. tLBCC: You have an absolutely stunning blog called Pinotte. What is behind the name Pinotte? And what kind of recipes are you featuring? Stephanie Gagnon: Thank you! Pinotte is a colloquial term used in french in Québec for peanut. It’s also the affectionate nickname my mom has been calling me all my life, “ma petite pinotte” (my little peanut). I get inspired by what’s available at the market and really, with whatever is going on in my life at the moment that I share a recipe—whether it’s my father’s favourite recipe for father’s day or the recipes I’m cooking for friends coming over for a get together. Sometimes, I call my mom and ask her for an old family dish that I’m craving. Those are the ones I’m most excited to share. 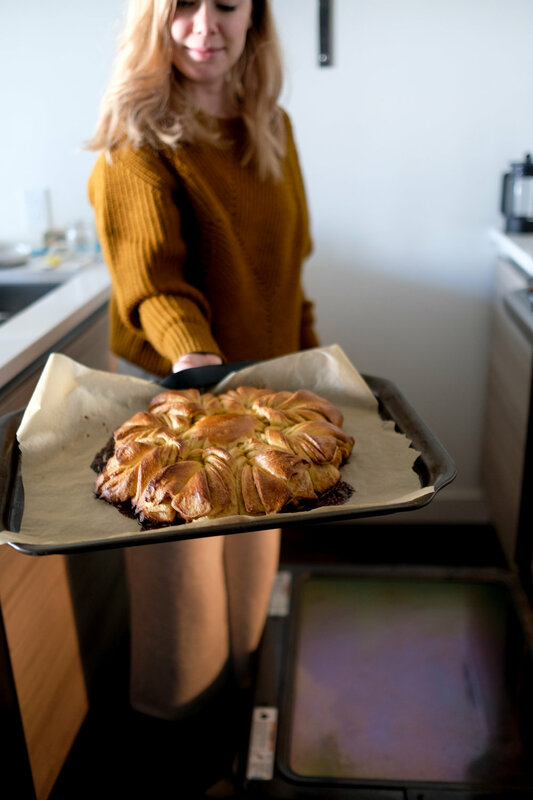 tLBCC: Although you have a background in math, between your role at Fika and recipes for your blog Pinotte, baking has clearly become the focus of your life. Do you find there are parallels between math and baking? What keeps you inspired to stay on your current path? Stephanie Gagnon: Of course, I believe there’s a bit of math in everything. I bet my old teachers would be happy to hear me say this! Baking is all about ratios. Whenever I am doing research to create a new recipe, I’ll look in cookbooks and online and I make an excel sheet with all the recipes I found, the main ingredients and ratios from each recipe so I can compare them. Obviously, the math I do now is way less complicated than my Statistical Data Analysis class in University and I usually try to stay away from calculations before the first coffee of the day! But, I gotta say that I love to work with my hands. It totally roots me down and my brain quiets down. The only thing that really matters when I’m baking is making pastries taste and look their best. And of course, the ultimate satisfaction is the reaction on people’s face when they come to Fika or when someone tells me they tried a recipe from my blog and they loved it. tLBCC: Do you have any advice or words of wisdom for someone who is interested in becoming a professional baker? Stephanie Gagnon: Well, I don’t know if it’s very wise for me to say this, but I think it’s true what they say, that your work shouldn’t feel like work. Like every job, it’s not all roses. The hours are unconventional, it’s very physical and you will get covered in butter and flour. However, it’s such rewarding work. If you love baking and you’re wondering if that’s the right path for you, I suggest you apply at bakeries first. Try it for a few months, see if it’s what you thought it would be. Then, you might consider going to school. I remember my first day as a baker, I told my colleague how unreal it felt that I was getting paid to make pastries. I still feel that way. tLBCC: Can you tell us what inspired this recipe for Saffron Cardamom Star Bread? Stephanie Gagnon: This recipe is a mix between cinnamon star bread and St. Lucia bun, which I mentioned earlier. I chose this particular shape because it’s the most stunning pull-apart bread I have ever seen and it’s perfect for the holidays. I replaced the cinnamon filling with a cardamom one, because it’s a popular spice in Sweden. 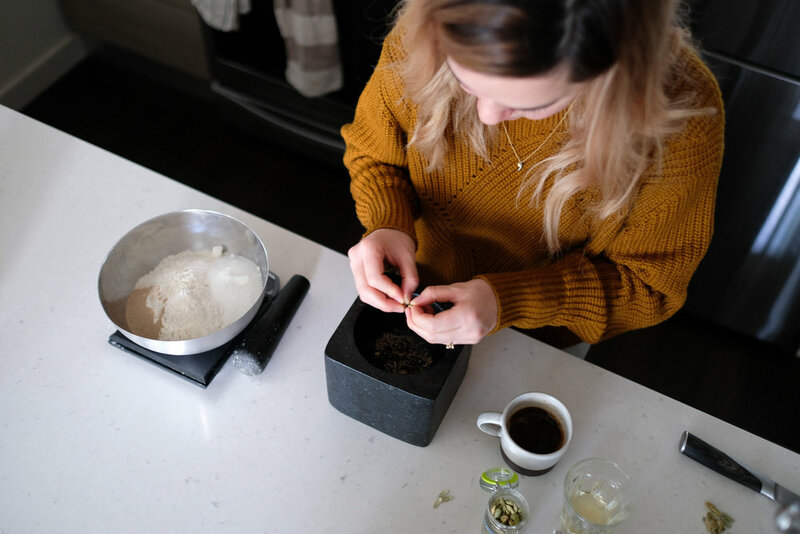 Ever since I started working at Fika and learning more about Scandinavian cuisine, I’ve become obsessed with cardamom and I think you will too after tasting this recipe! Ideally, steep the saffron in vodka overnight for a very yellow dough (or at least for an hour). Then, in a bowl, mix the flour, sugar, salt, cardamom and orange zest with a whisk. Add the instant yeast and mix again. In a small saucepan, melt the butter slowly. Transfer to the bowl of a stand mixer and add the milk. Use the same whisk used for the dry ingredients to stir the liquids. Add the saffron and vodka, as well as the egg. Whisk again until evenly mixed. Add the dry ingredients to the stand mixer bowl. With the dough hook attachment, knead on low speed until the dough pulls away from the sides—about 5 to 8 minutes. You can also mix the dough by hand if you don’t have a stand mixer, but it might take slightly longer. Grease a bowl (you can use the same one you mixed the dry ingredients in) and place the dough in it. Cover with a cloth. Let it rise in a warm place until doubled in size, about an hour. Clean the bowl of your stand mixer and place all the ingredients of the filling in it. Beat with the paddle attachment on medium speed for a minute or two, until it can be easily spread. Prepare a baking sheet and line it with parchment paper. On a clean floured surface, place the dough and divide it in 4 equal pieces. With a rolling pin, roll each piece of dough in a 9” diameter circle. Spread 1/3 of the filling on a first piece of dough. Place it on the parchment paper. Spread another third of the filling on a second piece of dough and place it on top of the first one. Repeat with a third piece of dough and top with the fourth, leaving it bare. You should now have four levels of dough with three layers of filling. Trim the edge of the stack to form a neat circle. Use a small jar and place it in the middle of the stack of dough, imprinting a small circle. 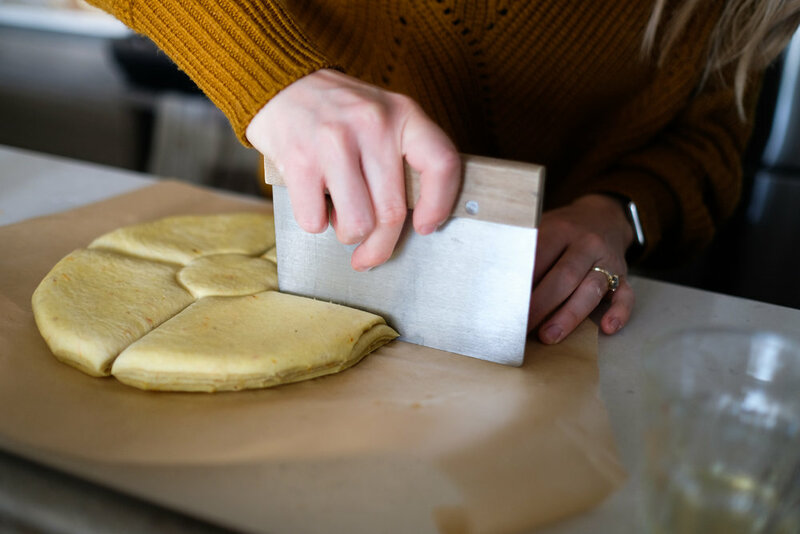 With a knife or a bench scraper, from the edge of the small imprinted circle, cut the stack of dough in 16 equal strips. With your hands, grab two neighboring strips and twist them away from each other twice. Pinch the ends of the pair of twisted stripes together to seal them. Repeat with all the stripes. Cover again with the cloth and let it rise until it’s nice and puffy, check on it once in a while. It took me about another hour. While it’s rising, heat the oven to 350°F. 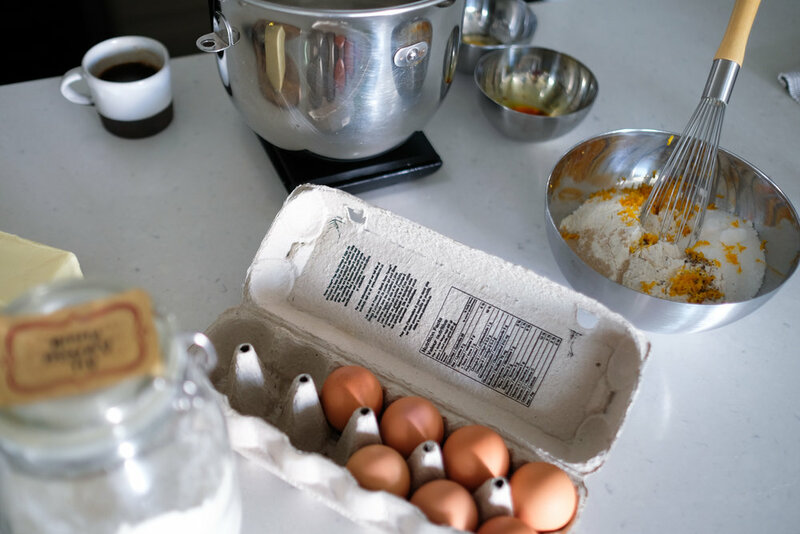 When it’s ready to go in the oven, make an egg wash by mixing the egg yolk and milk in a small bowl and brush the whole bread with it. Pop it in the oven for 20-25 minutes, until it’s golden. Let cool for 10-15 minutes before serving. Dust with powdered sugar. Pieces can be easily pulled apart. Share this star bread with lots of friends over a cup of coffee!